AgriAlgae® Original Organic is a high quality agricultural biostimulant based on an optimized combination of microalgae whose use is recommended in any crop throughout the whole cycle. 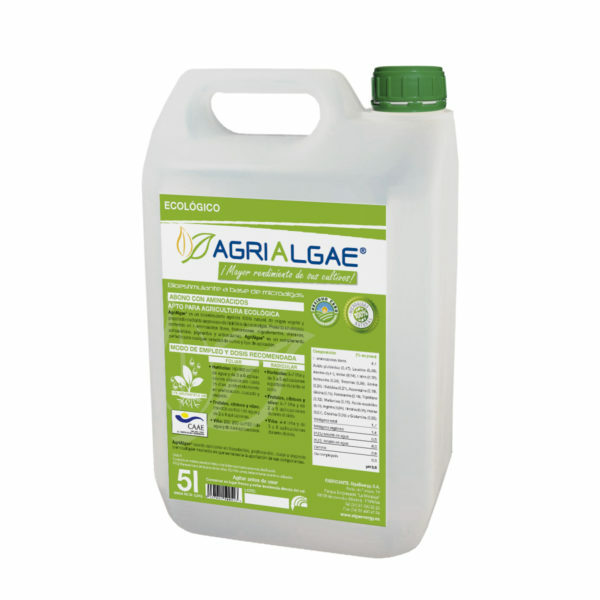 AgriAlgae® Original Organic contains 4.1% free L-amino acids (41 g/l). It also contains phytohormones, vitamins, minerals, pigments, peptides, polyunsaturated fatty acids and polysaccharides. This composition makes it an ideal product that will help you maximizing the crop yields and improving the quality and size of the fruits. AgriAlgae® Original Organic is characterized by its high assimilation by the plant, promoting both the root and the foliage development of the plant. In addition, it increases its photosynthetic capacity and promotes the regeneration of damaged tissues as well. In addition, it provides the crops with the tools to reinforce its immune system, making it more resistant to or boosting the recovery from stress episodes. This product is a perfect solution, specifically targeting the needs of the organic agriculture.